Positronium is a particle created when you bind together an electron and its antimatter counterpart, the positron. It doesn't interact with other atoms in the way we would expect, and this discovery could help us solve the universe's biggest mysteries. Positronium is sort of like a hydrogen atom, except if you took away the lone proton in the nucleus and replace it with a positron. Because electrons - and, by extension, positrons - are only 1/1836 the mass of a proton, that means positronium particles are much less massive than their hydrogen counterparts. The particle is a common byproduct of the interaction between regular matter and positrons. It's an unstable particle, only remaining together for an average of 142 nanoseconds before decaying into two gamma ray particles. During their very short lifetimes, however, it's possible to probe some of their properties and characteristics, and that's what researchers at University College London recently attempted. They tried a scattering experiment, in which they sent streams of positronium particles at different atoms and molecules and measured how they interacted. Because positronium is a hybrid of an electron and positron, they expected the particle to act in a way that was some sort of average of these two. But that isn't what they found. Instead, positronium acted precisely the same as an electron would. That doesn't make much sense - electrons are negatively charged, while positronium is neutral, and it's obviously twice the mass of a lone electron. In some weird way, the effects of the positron's presence seems to be cloaked so that only the electron half of the positronium interacts with other matter. Of course, "in some weird way" is a nice way of saying we currently have no idea why the hell this is happening, and there's a lot of theoretical work that will be needed to explain this effect. But doesn't mean we can't enjoy the practical benefits of this finding. The discovery of positronium's electron-like behavior could make it the best candidate to create a Bose-Einstein condensate, a special, ultra-cold form of matter in which particles move so slowly that it's possible to observe quantum effects on a much larger scale than is normally possible. Bose-Einstein condensates of various atoms have been created in the last 15 years, but a positronium condensate could have amazing new applications. Mills: "There are fundamental processes that can be looked at in new ways when you have matter in the BEC state. Having Bose-condensed atoms makes it easier to probe the way they interact under certain conditions. Moreover, to have motionless positronium atoms is an important aspect for making something called a gamma ray laser, which could have military and numerous scientific applications." Cassidy: "The eventual production of a positronium condensate could help us understand why the universe is made of matter and not antimatter or just pure energy. It could also one day help us measure the gravitational interaction of antimatter with matter. 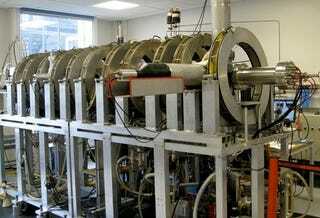 At present, nobody knows for sure if antimatter falls up or down." These are the sorts of cosmic riddles a positronium Bose-Einstein condensate could help us uncover, and the discovery that positronium likes to impersonate electrons should help us create this exotic form of matter. Besides, what could go wrong when creating something with a name as awesome as "gamma ray laser"? Nothing, that's what.